Violence flourishes without the feminine. There are things I know how to do. When a kid falls and scrapes her knee, I am so good for picking her up and soothing her, whether she’s mine or someone else’s. When a friend needs emotional support, I’m 100% there. But when I read the news these days, I feel kicked in the actual and metaphorical gut. I cannot find breath. Breath-taking violence. I imagine you can relate. I don’t have all the answers, I really don’t. Like you, I’m looking for more answers, and asking myself – what is my role here, what can I do, where can I give? Meanwhile, through the lens of my work with women, I find ground in what I do know, and I offer it as one piece of a very complex set of problems and solutions. What I do know is that this world needs the feminine now, more than ever. What I do know is that violence flourishes unchecked, when the feminine withdraws. What I do know is that each of us can, and should, start by being less violent towards ourselves – in our thoughts and behaviors. Every time we have a thought ‘I am too fat. Too old. Too insignificant.’ – that’s violence. When we say to ourselves: I am only good if I lose 10 pounds, or if I get all ‘A’s, or if I have a boyfriend, or if I wasn’t in debt, or if I weren’t depressed all the time. We think it’s the truth. And we don’t even evaluate it as a problem – or an outright lie – because we have been handed a legacy of self-hatred from our mothers, and our mothers’ mothers, and so on throughout so many centuries. So we don’t even take umbrage with the actually untrue and dangerously violent thoughts in our own minds. If we can’t detect, or object to, our own inner violent thoughts – how are we going to detect, speak up against, and take relevant action about the violence in the outer world? 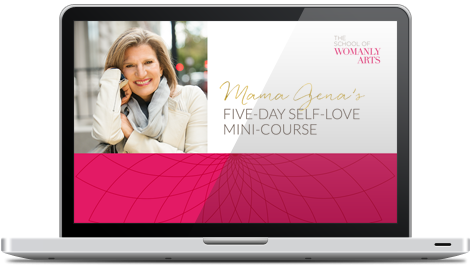 How can we actually bring forward our feminine gifts and inhabit a side of ourselves that has been oh-so-long abandoned? How do we re-consecrate this altar? The feminine body and feminine soul? When, for many of us, the feminine is utterly unfamiliar territory. We have been taught to man up. Put nose to the grindstone. Win at all costs. Hide our feelings. Be logical and practical. Go at it alone. And to live in the duality of right and wrong, and mostly feeling wrong wrong wrong. Experiencing our full emotional range – or simply, feeling. How do we reclaim that which is truly ours? How do we re-awaken the long forgotten feminine from being stuck so long inside our suffocating little man-suits, and start to truly feel? We can start by making a teeny tiny bit of time, each day, to celebrate the values of the feminine. For example, this week I have been pressing the accelerator on my radiance. As a woman, each of us has the power to turn on. We can decide to shine our inner light in any direction we choose. If someone is unwittingly or wittingly rude to me, I can choose radiance, or I can choose retaliation. Today, right now, this moment, I choose radiance. A friend of mine blew me out of his life 6 months ago. When I saw him, last night, for the first time in ages, I told him of my sadness, hurt and anger, but with deep empathy and love in my heart. And I asked him how things have been for him. I felt awkward. Clumsy. Tears came for both of us. I wanted to leave my softness and go to anger, but I gently held on to my light. Light is fragile. Anger is more familiar. Yet it felt good to be so vulnerable. We are closer today than we have ever been. That is the gift of the feminine. If each and every woman were to embody a small drop of her feminine, each day, we could all ‘Be the change,’ as Ghandi said. Whether it be radiance, intuition, emotional range, surrender, or sisterhood – one drop, each day – we could accelerate the reclamation of these values, not only for ourselves, but for everyone on this tiny, beautiful vulnerable planet that we share. In the comments below, tell me how you are already connected to your feminine, or the ways you want to connect more deeply to her. P.S. Do you have your ticket yet? 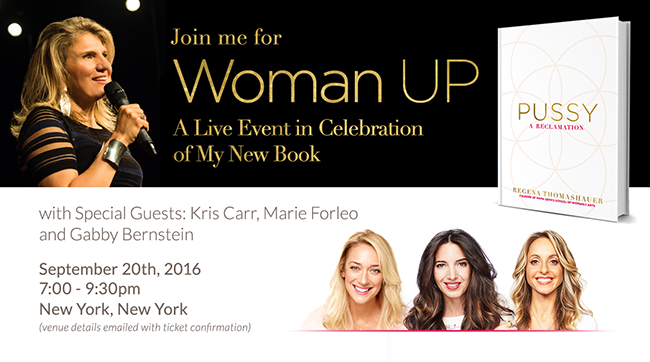 My new book is coming, and I’m hosting a legendary evening to celebrate, and join in Sisterhood. The world needs turned on, awakened women. I hope you can join us! Click here for details & tickets!